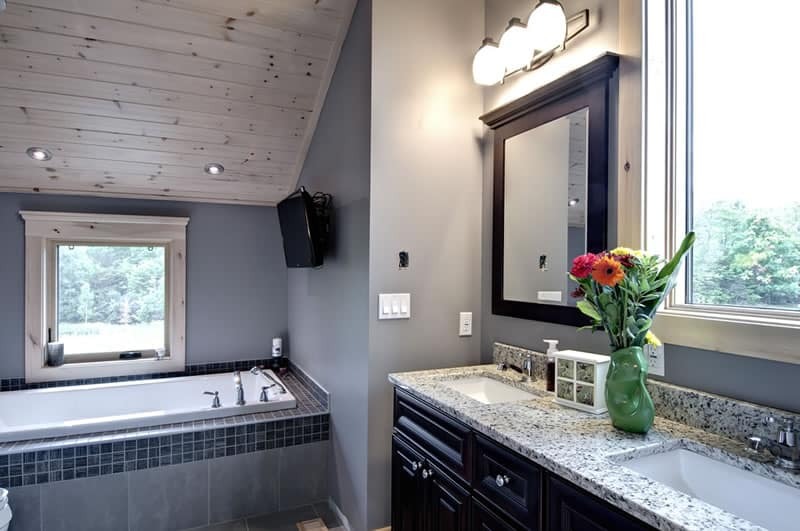 A beautiful, spacious home with rustic appeal combined with modern luxury, The Elwood is a custom plan created for Rich Kinsman, our VP of Sales here at Confederation. 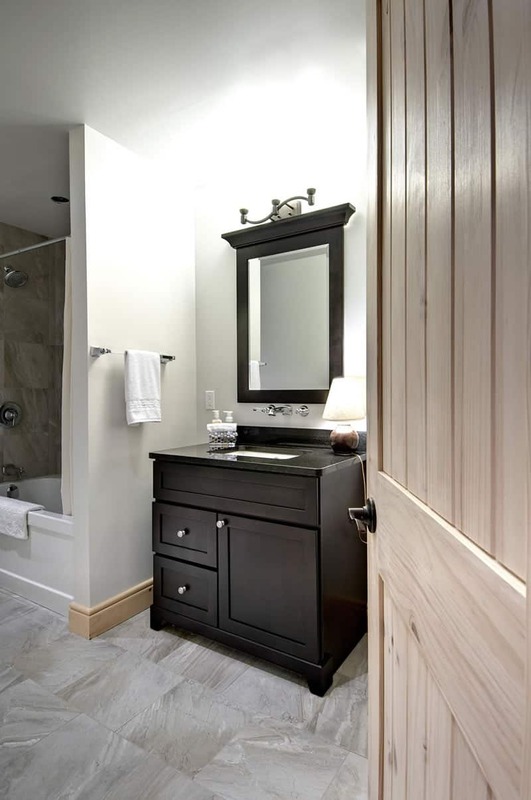 He worked closely together with our design team to create this custom design. 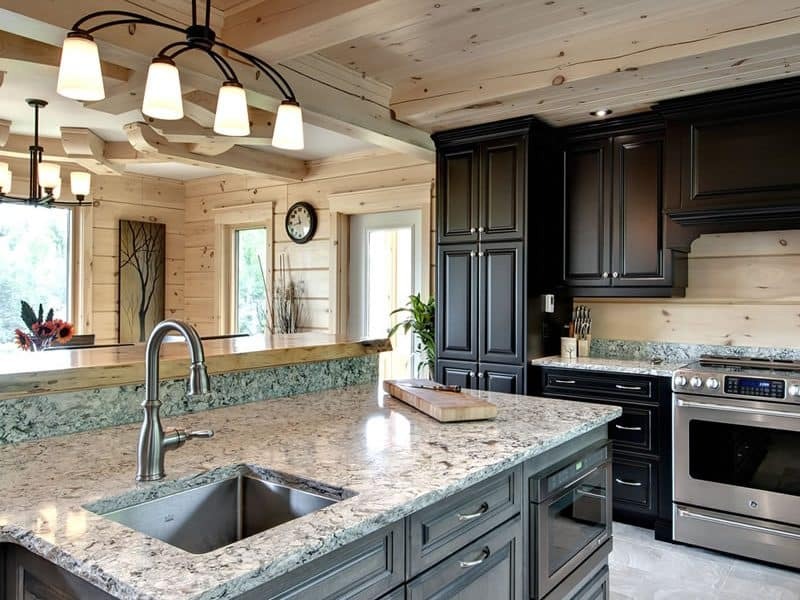 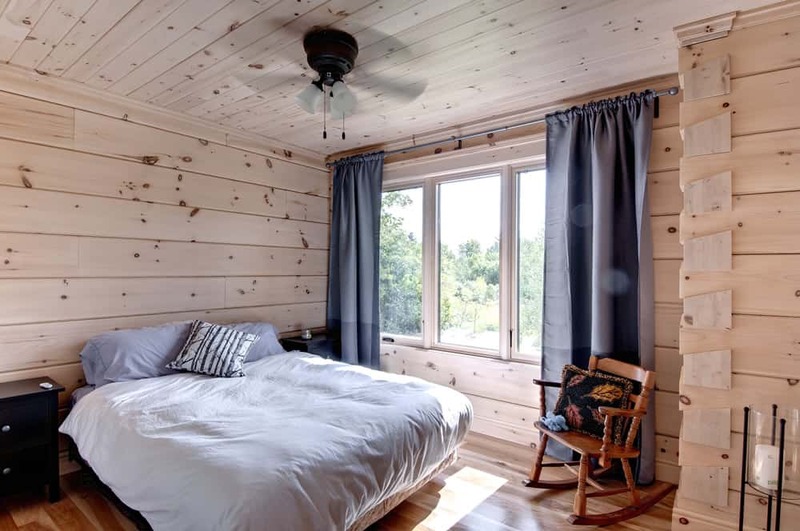 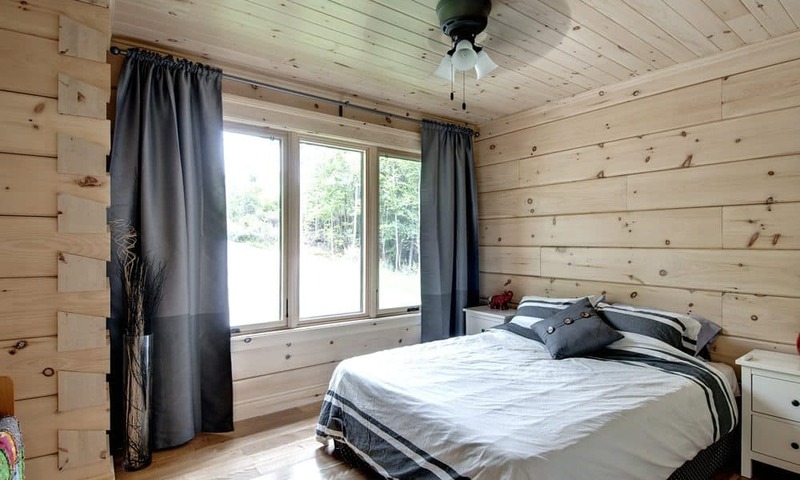 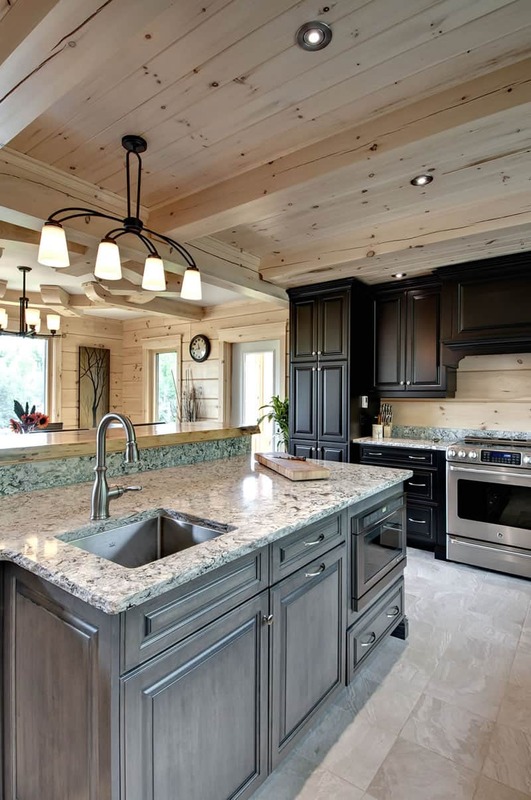 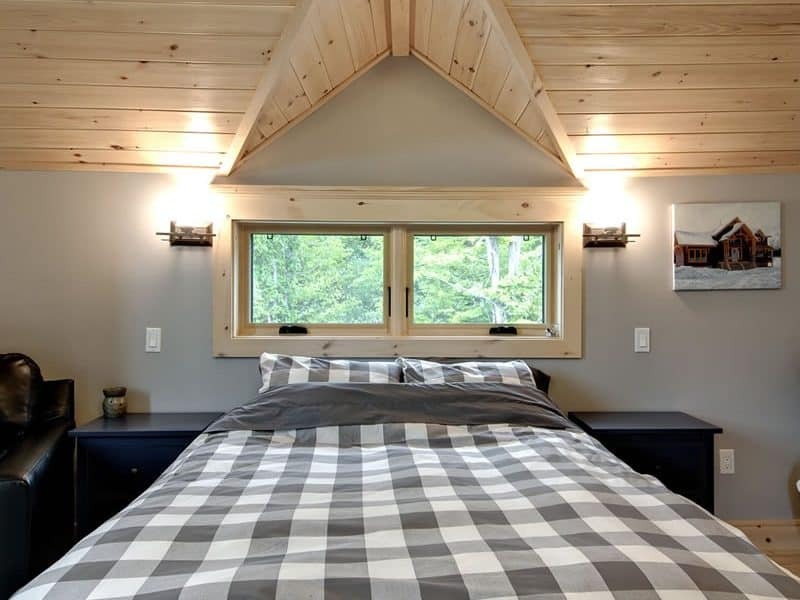 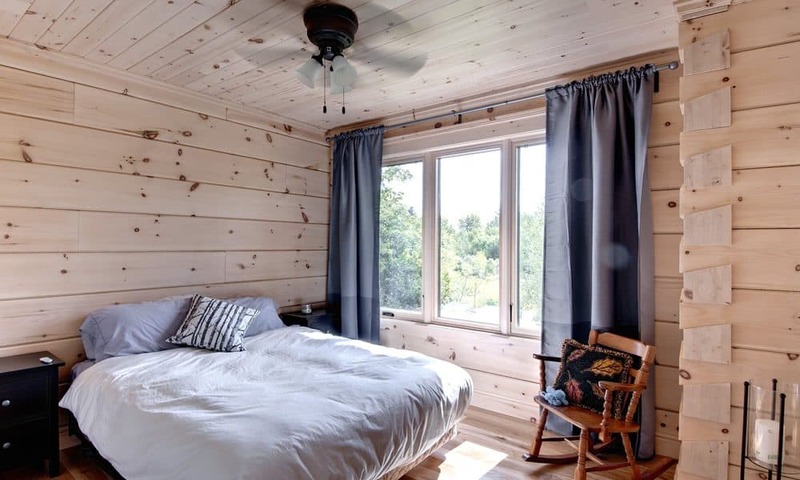 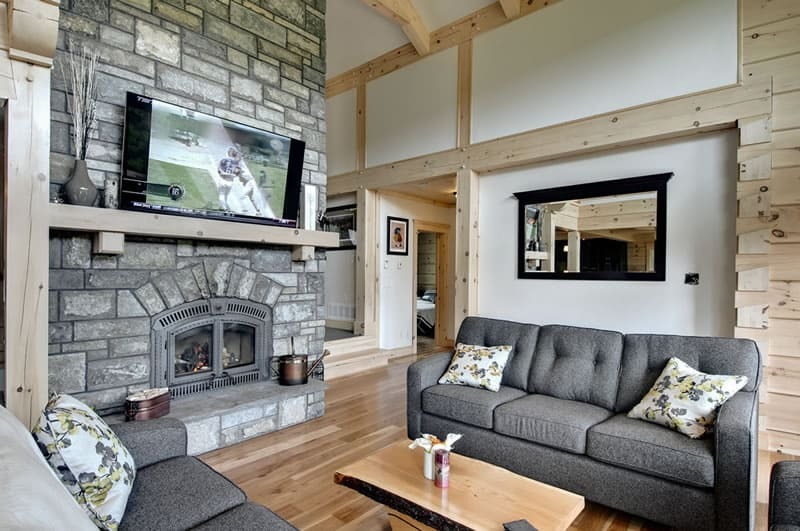 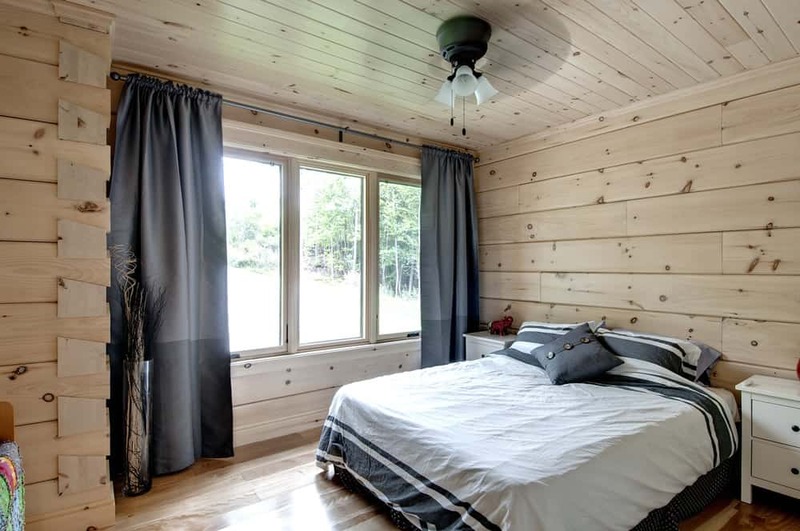 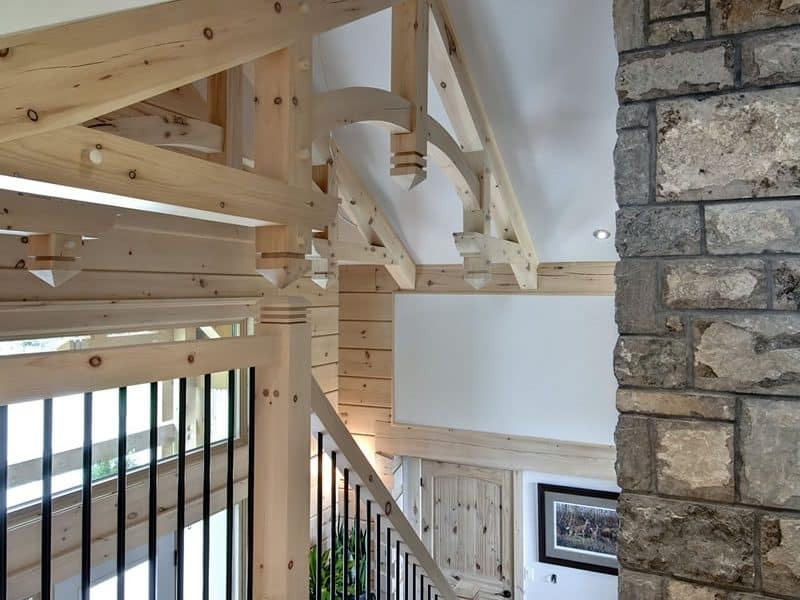 For his home, Rich wanted log walls on the exterior, but a timber frame look inside. 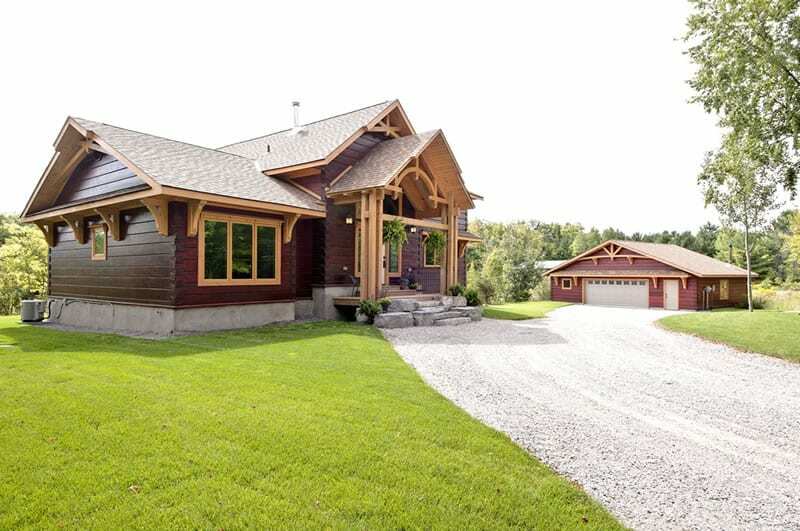 On the exterior, the logs are stained a deep burgundy color while the accents feature a natural log color. 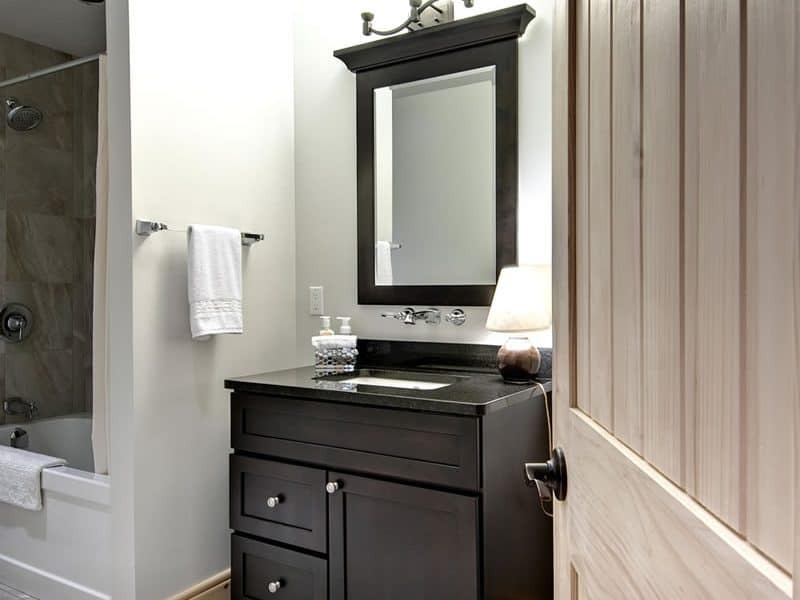 The two-tone effect adds depth, interest, and a unique character to the home. 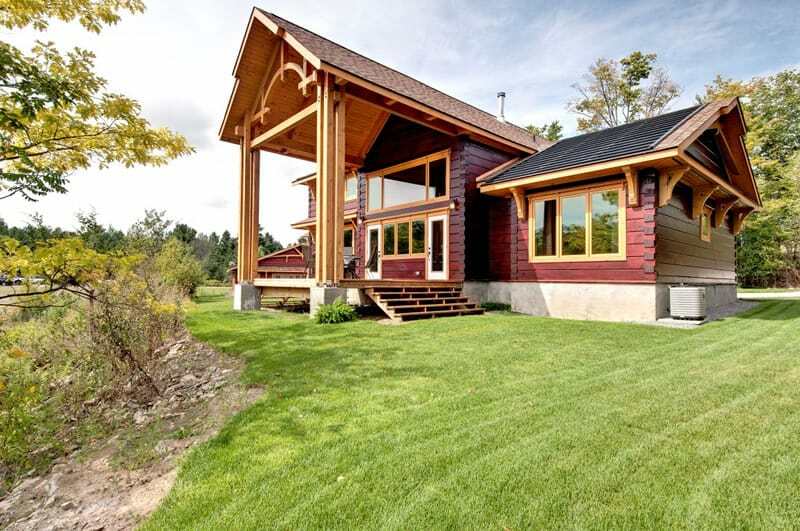 Front and back both feature a covered deck to enjoy a panoramic view of the land. 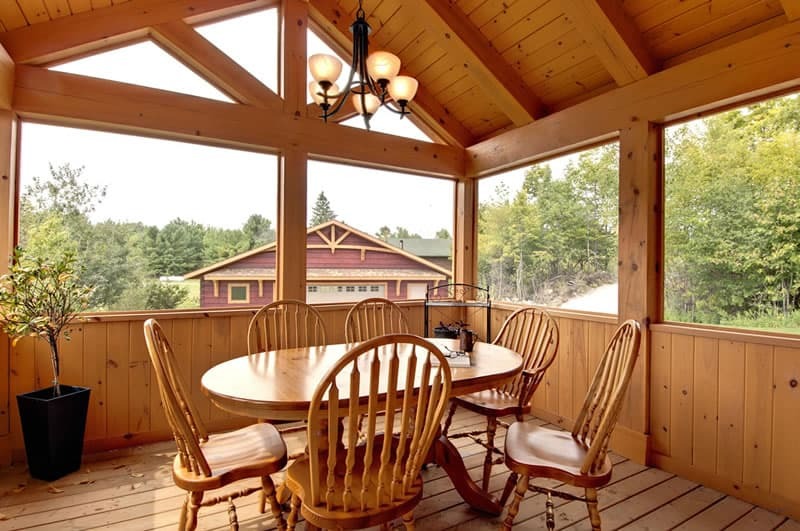 No matter the weather, the covered deck allows enjoyment of the outdoors with protection from sun or rain. 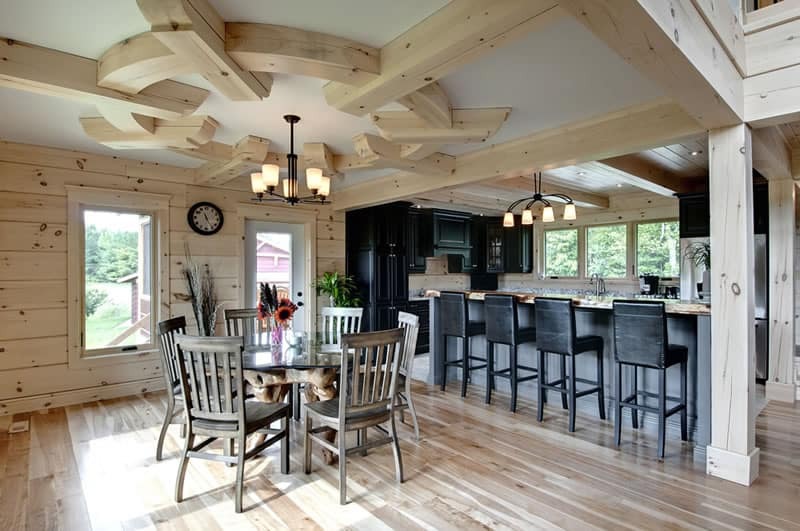 Inside, the striking two-tone look is continued with a mix of wood walls with drywall. 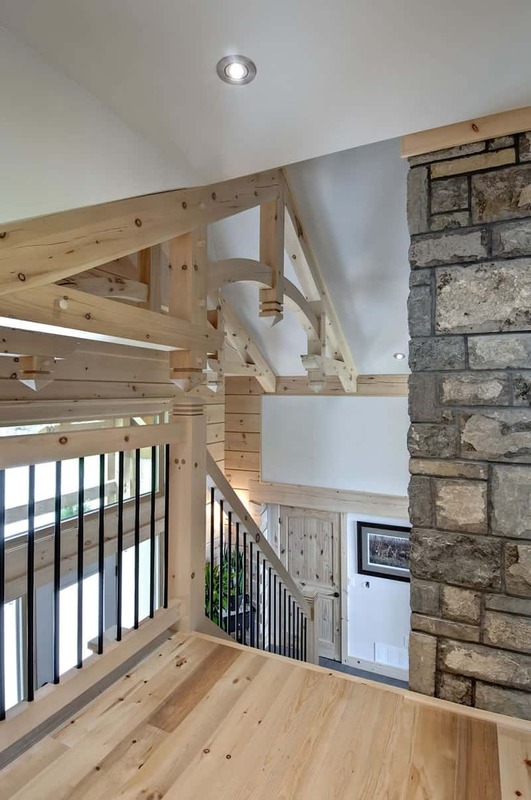 Posts, beams, and timber work throughout the entry and great room evoke the cozy but impressive feeling of a timber-frame home. 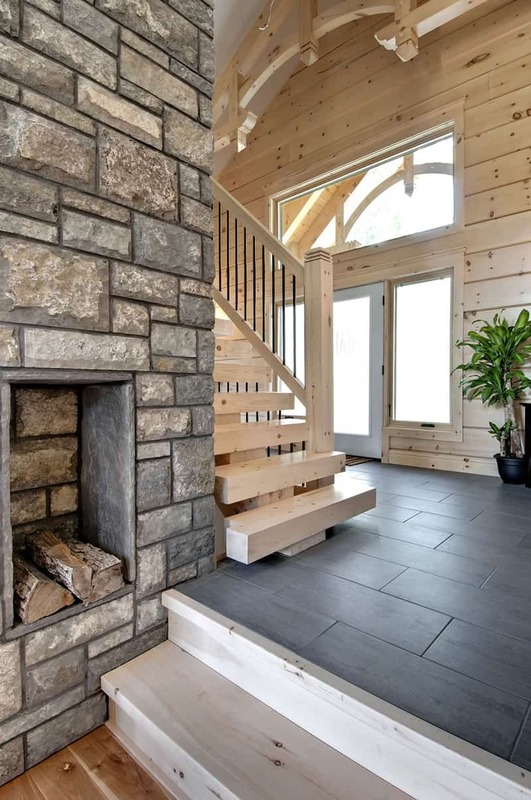 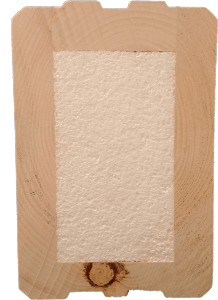 The Ellwood might have a traditional look, but it’s actually the first home we built with the EEE Log, an insulated log that’s hollowed and filled with insulation instead of solid wood. 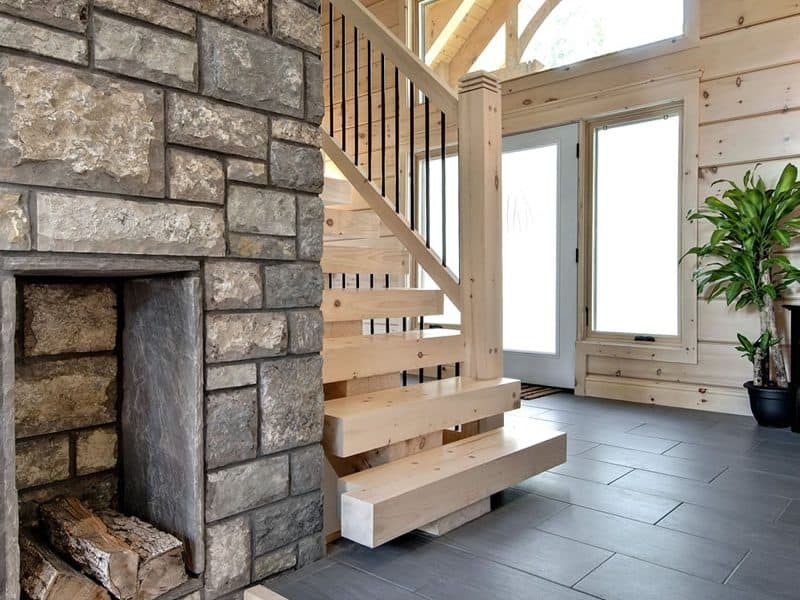 When you walk inside, a four-sided 20′ stone fireplace is the centerpiece that immediately catches your eye, with a waterfall facing the entry. 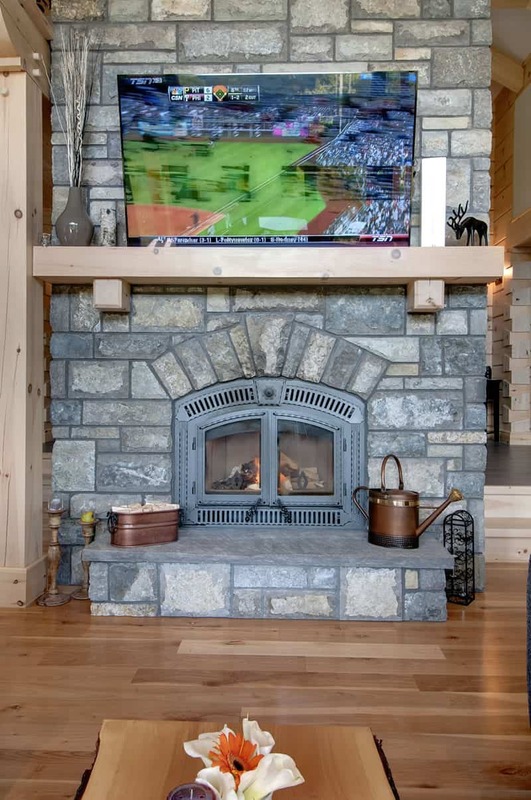 The other side has a wood burning insert that faces the great room, efficiently heating up most of the house. 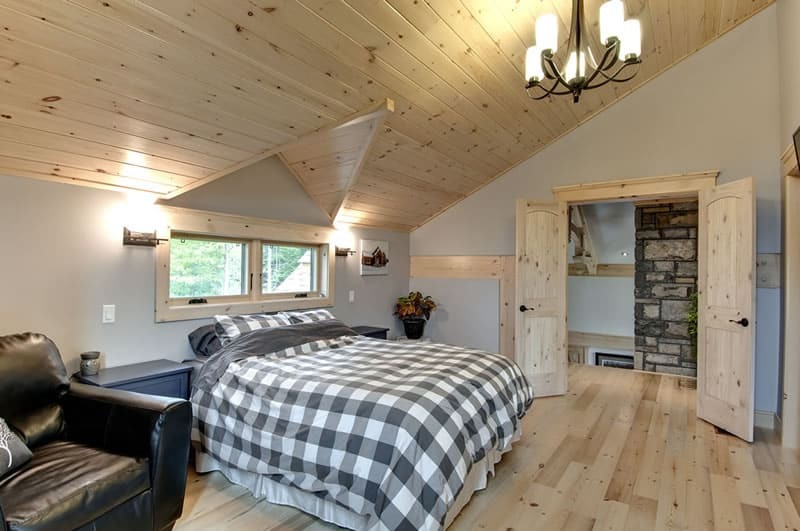 The main floor also has 2 bedrooms and a full bath. 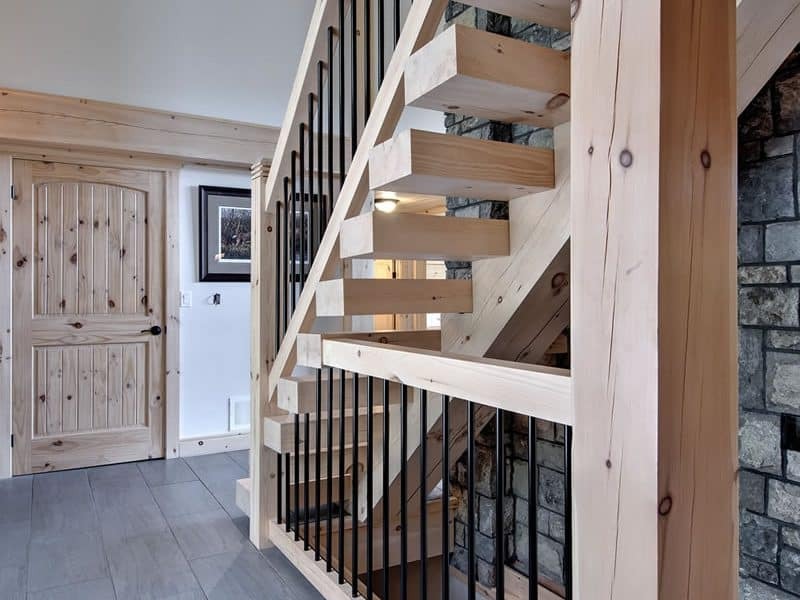 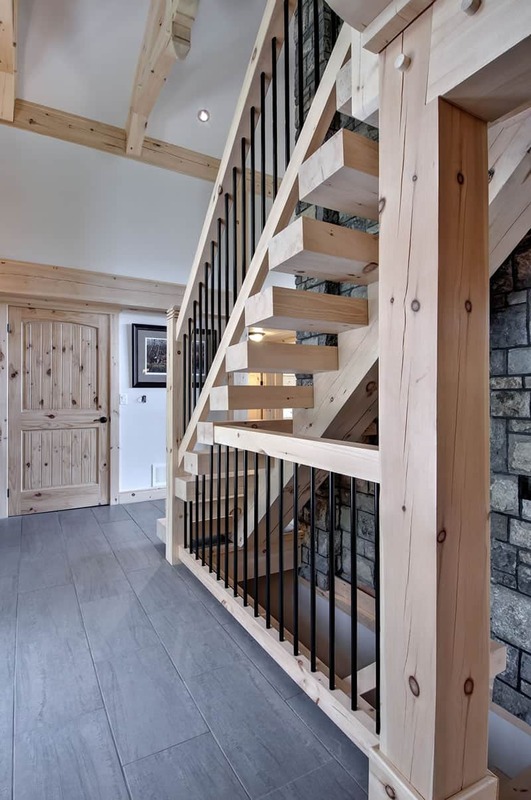 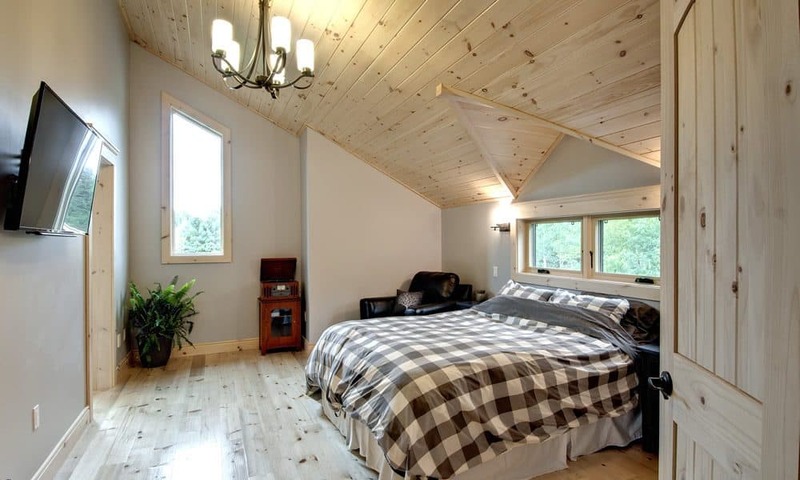 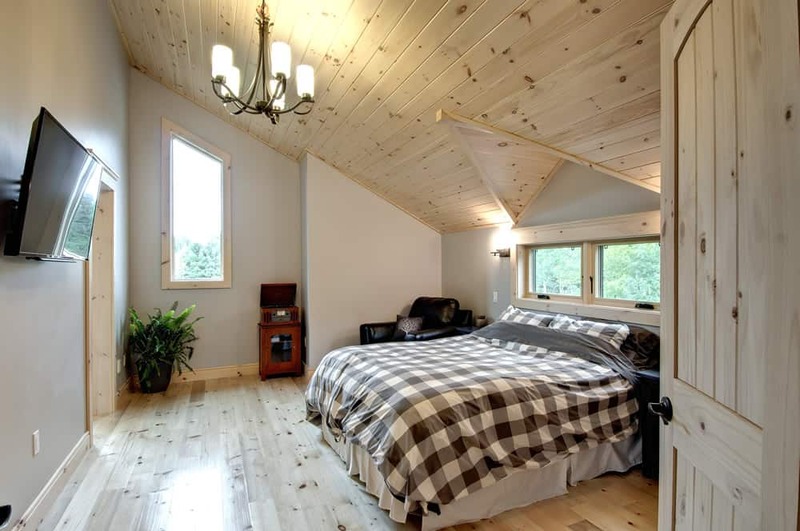 Up the custom timber staircase, the master bedroom includes a large walk-in closet and ensuite bathroom. 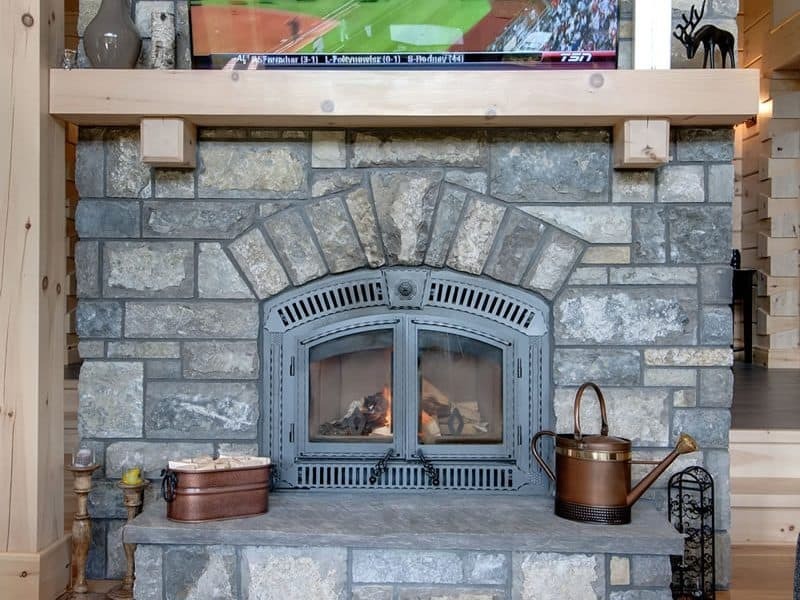 Rich also opted to add a basement. 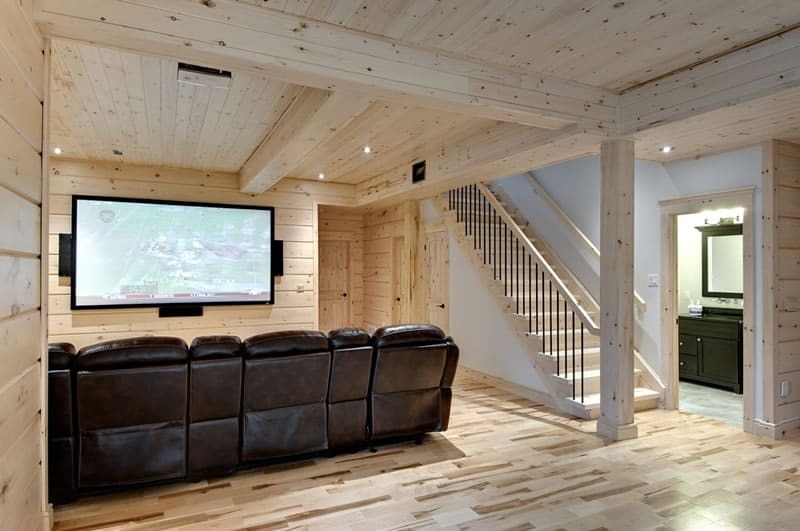 Though the lot didn’t accommodate a walkout basement, we worked together to design a 10’ ceiling to fit his needs. 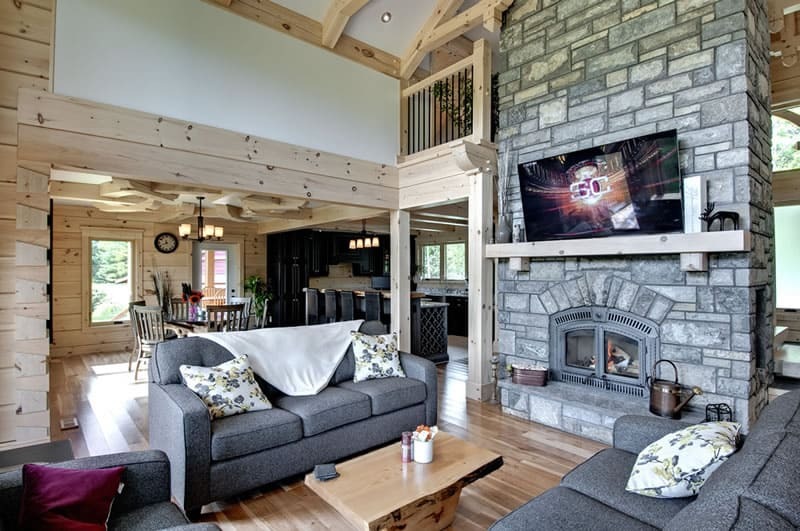 The 100% wood basement includes a spare bedroom and full bathroom as well as laundry room, and has plenty of room left over for a bar, pool table, and theater. 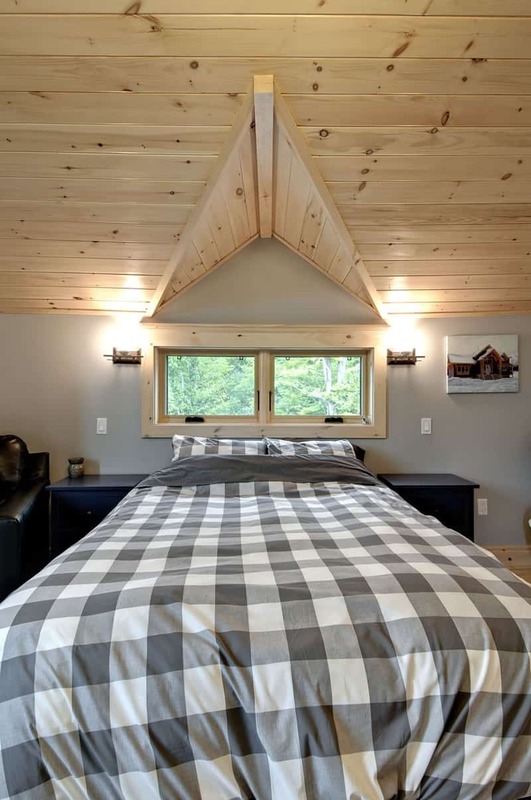 Though Rich’s lot presented some unique challenges, we worked together to create this beautiful plan to fit his needs.